Tammy Algood is not the name that comes to mind when one thinks of "complete" Southern cooking, unless you live in Nashville. Algood is quite the star on local television and at many Tennessee wineries. Tennessee, not just for whiskey anymore! 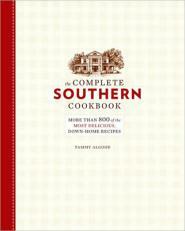 The Complete Southern Cookbook features 800 recipes spanning nearly 500 pages and not a picture to be found. A cookbook with out photos these days is a rare commodity --in fact, it is often thought of as poor "commodity." We have often complained this year (and last) bout the dearth of seasonal-farm-to-plate-eat-locally cookbooks with chickens and tractors adorning the cover. So the plain cover with the single etching of a Southern vernacular home and the straight forward, recipe upon recipe actually makes Algood's book stick out in this era of overproduction. And, it is an abecedary! We just love those. Not a winter-spring-summer-or-fall recipe in the entire book. Cook the dish when you want to without being scolded for making Fried Green Tomatoes in the middle of December. Got bacon? Algood has recipes with bacon. Cola? She has cola recipes. Mac and Cheese? Page after page of ooey gooeynes. Yes, this is Southern cooking from A to Z. And speaking of "Z" here is one of Oprah's favorite things. Preheat the oven to 350°F. Lightly grease a 9-inch pie plate and set aside. In a mixing bowl, combine the zucchini, eggs, onions, baking mix, cheese, oil, salt, pepper, sage, and paprika. Blend well. Transfer to the prepared pie plate. Bake 45 minutes or until a tester inserted in the center comes out clean. Cool 10 minutes on a wire rack before slicing and serving. This recipe is both retro and tasty. In many ways, a fitting example of Tammy Algood's The Complete Southern Cookbook. While no one is more overjoyed than I to see the plethora* of Southern cookbooks on the market filled with new and innovative ideas, it is equally as joyous to find a cookbook, devoid of any embellishment, that so beautifully captures Southern food. * I recently read in some cooking magazine (hum...it just doesn't seem to stand out, now) that one should never use the word "plethora" in writing about food, something about trying to sound smarter than you are. This begs the question -- What if you ARE smarter than the person telling you not use plethora? I personally love "P" words and plethora is one of my favorites -- so read this a veritable plethora of screw you.